In this MERGE 2.0 video course, revenue growth expert Bill MacDonald takes you through a series of training modules guaranteed to help better understand your buyer and his or her buying journey ─ from how they think and envision their solution to how they want to engage with you in the buying decision. To succeed in sales today, you must overcome researched-based facts that prospects are quite happy to buy without your input. 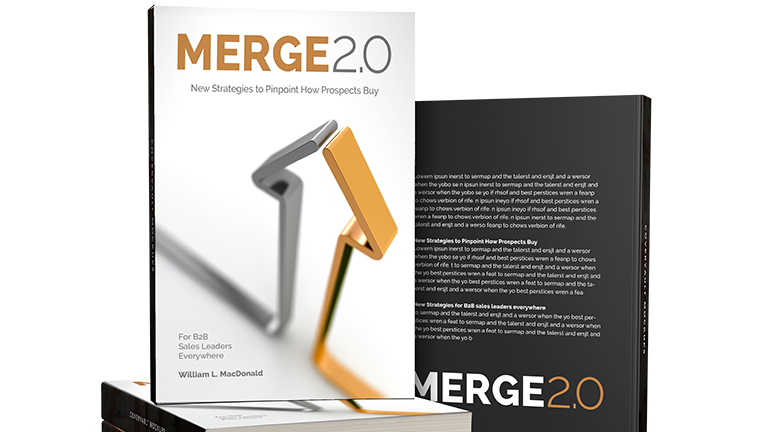 Take back control of the sale by mastering the most comprehensive and reliable sales process on the market today: MERGE 2.0. Plus, you can memorialize all your study in a dedicated workbook. View. Learn. Apply. And watch your sales record surge. Module 1: Introduction – In the sales business today, the effort required to get someone to say yes and buy from you is more difficult than ever, especially in B2B complex sales. This module sets the stage to demonstrate how MERGE 2.0 positions you to understand buyer issues and make the sale. Module 2: How the Course Works – In this module, we walk you through the five stages of MERGE 2.0 and lay out the course with data and case studies to give you the maximum value. Module 3 – Magnify (“M”), The Research Mindset – Magnify is the first stage of MERGE where you learn to research prospects and uncover top-of-mind issues. Armed with research, you can bring a valuable perspective to each prospect engagement. The module is filled with research tools you can access today for critical information. Module 4 – A Sales Process Aligned with How Prospects Buy – Today, professional selling is all about how you sell, not what you sell. This module focuses on groundbreaking and timeless research conducted by a renowned psychologist on how buyers think and make decisions. You learn to pinpoint where prospects are in their decision-making process and how you can help them shape a vision for their solution. Module 5 – The Merging of Multiple Decision Makers – Studies show 5.4 to six decision makers contribute to the decision-making process in complex B2B sales, a process which can unfold over many months or years. In this module, you learn to identify each decision maker and develop an internal champion to help you close more complex sales. Module 6 – Create the Prospect’s Vision for a Solution – Before any selling begins, you need to determine if your prospect has a need and if he is aware of that need. You do not want to lead your conversation with what your product or service or how your solution is a good fit. In this module you learn to help your prospect shape a vision for the solution to the need, then you lead your prospect to your products and services, not lead with your products or services. Module 7 – How to Secure Executive Appointments Under Favorable Conditions – In this module, you learn how to target markets and create unique messaging to secure high-level appointments with C-level decision makers under favorable conditions. What’s more, you learn a formula to create repeatable messaging that produces more predictable results. Module 8 – Explore – Meeting Plan – In this module, you learn how to take your research from Magnify and organize a meeting around your findings to bring more perspective to your prospect meetings. This repeatable process uses a formula to open the meeting with a focus on what is top of mind with your prospects, then organizes it to reveal issues and problems they face, against which you can sell. The Action Commitments provided help you engage the prospect to continue the sales process with you. Module 9 – Unseat the Incumbent – Because of intense competition today, we see more and more instances where an incumbent provider presents an obstacle, demanding we go into head to head in competition. In this module, you learn three strategies to help you unseat the incumbent without the street of direct competition. Module 10 – Commit to Crossing the Chasm – In the MERGE process, crossing the chasm is the critical stage where the prospect needs to commit to change. At this point, too many opportunities are lost to no-decision. In this module, you learn how to make the status quo unsafe for the prospect, sell the problem, and get his commitment to change. You also learn to uncover the need, the need behind the need, and the undiscovered need that will lead you to Recommend (“R”) a process for evaluating alternative solutions. This process enables your prospects to self-discover your solution. Module 11 – Generate (G) – Creating Alternative Solutions – In this module, you learn to understand and apply a thought process through divergent thinking that collaborates with prospects to find the right solution. We call this hypothesis- based selling. It is the smart way to break down complex or ambiguous problems and quickly begin to drive toward an answer or solution. Module 12 – Engage (“E”) Stay Close to Customer/Clients – In this module, you learn how to stay close to your customer/clients to upsell, cross-sell and acquire new customer/clients by leveraging these relationships. You also learn how to spot triggering events and understand the lifetime value of your customer/clients. Module 13 – Putting MERGE 2.0 to Work – In this module, Bill MacDonald shares tools to ensure the MERGE process becomes intuitive and a common language in your organization for repeatable success and revenue growth. Module 14 - Bonus module – The Road to Becoming a Trusted Advisor – Here, we offer a short overview of how you can find needs your prospect did not uncover, as well as solutions others may have overlooked.